DRM had, without my knowledge, been added to my book. I quickly checked my other books; same thing. Then I checked the books of authors who, because of their vocal and public opposition, I know are against DRM – Konrath, Howey, and Doctorow, to name a few – same result. ALL books on WHSmith have DRM in them. At this time I don’t know who is putting the DRM in the books, but I strongly suspect it is WHSmith. If you haven't heard about this yet then I'd suggest you ignore the story. The claim that WHSmith added DRM is baseless because one, it's technically impossible for the bookseller to decide to add DRM, two, no one who reported on the story bothered to buy an ebook and verify that it had DRM, and three, this turned out to be a website bug. First of all, this claim makes about as much sense as whining about WHSmith putting an ugly book cover on a paper book. It is about that ridiculous. WHSmith can't make any decisions about DRM because they don't handle that end of the ebook transaction. This bookseller is a partner to Kobo. When it comes to ebooks Kobo is the one that is actually handling all the back end technical stuff, not WHSmith. Second, this attack on WHSmith reminds me of the Lendink lynch mob. Last August a bunch of authors freaked out and made a baseless accusation that a legit ebook lending site was pirating their ebooks, only they forgot to confirm that Lendink was indeed pirating their ebooks. I am bringing that up again because the author who posted the original complaint never bother to confirm his allegations by buying one of his ebooks. If he had bought an ebook and downloaded it he would likely have discovered that the ebook did not have DRM. 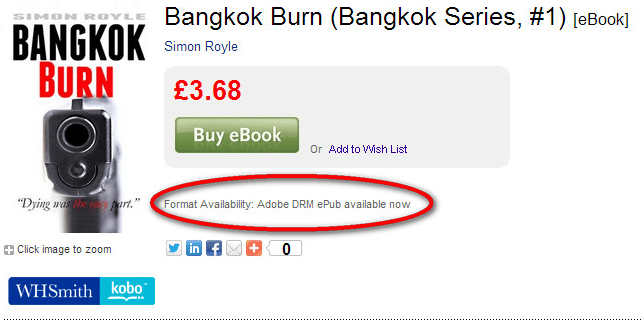 I can't buy his ebooks and confirm the lack of DRM because WHSmith won't sell to me, but I would bet that I am correct. This issue has been confirmed as a website bug by Kobo. Curiously enough, this bug has not been corrected, but the website has been updated in response to the kerfluffle yesterday. If you go check that author's ebooks on the WHSmith website then you will see that they no longer are listed as having DRM. The same goes for Cory Doctorow's ebooks. While that might sound like the problem has been fixed I'm pretty sure that WHSmith swapped one label for another. In any case, I refuse to believe any part of this story without proof. There's this thing called evidence, and so far no one has presented any. Can we call the anti-DRM crew reactionary yet? Yes. The notion that one can own what one buys is an old-fashioned idea. It has no place in a world where corporation are legally people.